Despite the fact that an ex boyfriend ran off with another woman and bought her a Cadbury Crème Egg every day as a romantic gesture, Cadbury Creme Egg still remains a favourite of mine. Maybe I just don’t get attached to guys, maybe it was the fact that she didn’t actually like Crème Eggs and gave them to her friend rather than tell him or maybe, it’s simply that Crème Eggs are just so darn good that not even a broken heart can spoil their chocolatey loveliness. I started taking Crème Eggs seriously when I was 10 years old. I made a chart for my bedroom wall where I noted all relevant details of each Crème Egg I had. I would then glue the foil wrapper onto another chart by the side of it. I have no clue whatsoever what the relevant details were but I think my aim was to prove how many Eggs I could eat. I wasn’t in competition with anyone else so that automatically made me the Crème Egg Champion. You think I was a daft kid? Well think again…. I would show this chart to all visiting Aunts and Uncles who were either a. so impressed by my handywork or b. Couldn’t quite work out what to say that they always gave me some money to buy another Crème Egg. Actually I lie, I wasn’t ten when my Egg obsession started, I was actually about 5. The only way to eat the egg when I was five was to nibble down slowly until I revealed the Crème Egg as it should be: a perfect circle of chocolate, surrounding the creamy white fondant filling and in the middle had to be an un-smudged golden yellow yolk. I would drive my Mum nuts with this fad as I insisted she showed much glee at each and every yolk-achievement I made. So I was daft at the age of five? Think again… I recall doing the nibble-to-the-yolk routine one day whilst Mum was still chatting to the lady in the shop. As the egg slowly disappeared I noted with much childhood dismay that (shock, horror) the yolk was MISSING. Tears rolled down my cheeks as I produced the remnants of the yolkless egg to my Mum. The lady shop-keeper either a. felt sorry for me or b. wanted the crazy kid to leave her shop and so she gave me a free Crème Egg! These days I am a bit more private about my Crème Egg escapades. This year I shall be mainly eating my Eggs in two halves. Filed under cadbury, egg, fondant, milk chocolate, uk. I’m not sure if you know about these or not, but Cadbury’s have just released a Creme Egg Bar! 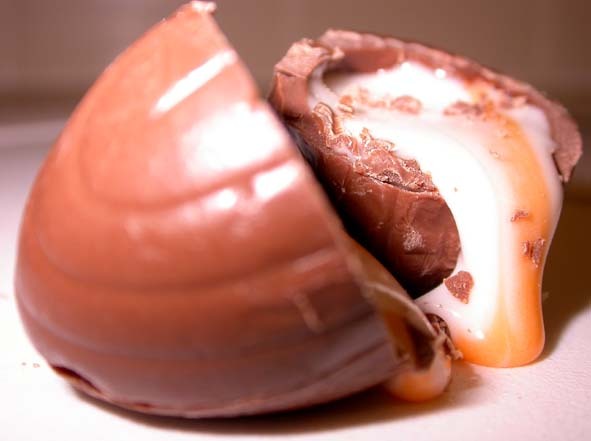 Cadbury Cream Eggs are the best ever – they start appearing around middle of January. I try to resist but so far after 45 years, no can do. So I look forward to this time of year (when will my Cream Eggs appear on store shelves) Everyone should at least try one, but bet you can’t resist just one. cream eggs..mmm..delish. I know what you mean about the yellow bit in the middle. How about cream egg with dark chocolate?